A one-day workshop that truly fills the gap of information in both concealment work and in close fighting with weapons. This is NOT a live fire class. This is mindset and low to medium level force-on-force class, using blue guns and stun devices, to learn the finer points of concealment and close-fighting work with weapons. We will go in depth like never before into the fieldcraft of concealment, which is so much more than hiding a weapon. “Concealment” is the concealing of weapons, intentions and capabilities throughout the duration of the event. 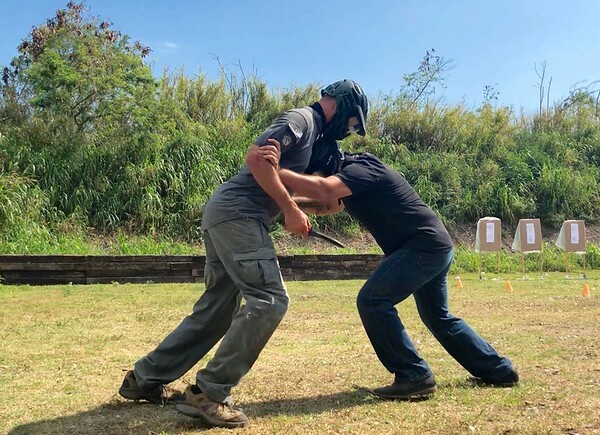 Participants will learn that concealment is an art, and can be specifically a martial art–one that criminals have developed to a very high level of effectiveness. We will cover the true meaning of “blending in” using the environment and the “energy” of those natively in the environment. Students will get the chance to both act in concealment and to observe those acting in concealment. This concealment work will continue on to cover advanced safety, moving through crowds and around innocents without adding harm, and movement for assault/defense in crowds or around obstacles. There are many courses and styles of training available to learn grappling, wrestling, and fighting empty-handed. However, in my experience, many of the fights that happen as a result of a lethal force attack will involve one or more weapons, the attackers and yours. In this course we will focus exclusively on the weapon-based attack and counter attack. Most counter ambush tactics taught today are based on the military or law enforcement situation. These are not as applicable for the lone civilian or undercover/off-duty officer. To fill this gap, we will discuss and demonstrate violent criminal ambush and the necessary counter ambush to deal with this very specific threat situation. Participants will be given the option to learn counter knife work using stun devices that realistically need to be avoided just as the knife would. Handgun technique will be emphasized, including the many forms of the surreptitious draw both preemptively and during the fight. Students will begin to learn the strategy and discipline of not prematurely “going to the gun” before they can actually clear it and use it effectively (thereby correcting a very common and natural mistake). Quite frankly, this workshop provides the information that neither the range nor the dojo can provide alone. This is a “no one gets pushed beyond their safe limitations yet no one gets left behind” level of class. Everyone will be challenged appropriately. You will be vetted when you sign up. Bring your own hydration and calorie snacks. You will need them. Plan for your own lunch accordingly. A sparring mouthpiece is optional. You will NOT need your handgun or any weapons for this class. IF you have a Glock 19 or 17 holster that you actively carry, bring only that holster to class.